Facebook has now traded on Nasdaq for about a week. Following our habit to price things in gold ounces rather than funny money like the USD, we have decided to track the Facebook share in terms of our favorite unit-of-account. We gave Mr. Warren Buffett a hard time for his views on gold some time ago. But we fully agree with him that investing in an IPO at a price of around 100 times the annual profit seems to risky and that it’s hard to see that kind of value in the Facebook share. There simply isn’t enough margin of safety. But like Mr. Buffett, we also agree that this isn’t the same as excluding the possibility that the share might stand higher in the future. As Warren Buffett rightly pointed out, gold doesn’t yield any return but only sits there. That’s exactly why we prefer it as unit-of-account and as cash. So let’s see how Facebook performs against cash. As noticed, we have included the price both in USD (top chart) and in gold ounces for added perspective. In terms of USD, Facebook opened at 38 and closed at 31.91, i.e. has lost some 16%. 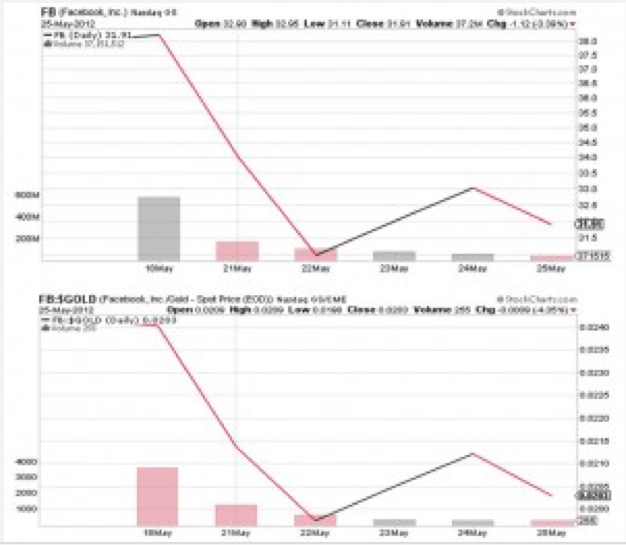 In terms of gold, Facebook opened at 0.0264 and closed at 0.0203, i.e. has lost some 23%. Some difference, but it’s only after one week. Let’s see how this develops in the coming weeks, months and years. We will follow up every week in the Weekly Market Update, as long as we find it interesting. Make sure to subscribe to the Weekly Market Update to follow the development.